a gorgeous litter of 9 f1b Sheepadoodles born November 25th. Based on their 48 pound Poodle mom and 53 pound first generation Sheepadoodle dad, we expect this litter of f1b Sheepadoodle puppies to be 40-60 pounds full grown. It was so much fun watching these little f1b Sheepadoodles grow into their personalities! Each of these amazing puppies has a wonderful attitude, and seem very cheery. We believe they will make outstanding family members for a few fortunate forever homes. Sash is a sweet Sheepadoodle who is beautiful both inside and out! Her endearing personality complements her beautiful black and white coat. Sash is never far from a playmate, whether human or canine, and will make a great companion! Sienna is a pretty little girl with an adorable face you just can't say no to! Her cheerful spirit always make us smile and her snuggles would warm even the coldest heart. With her soft fur, beautiful black and white coat and winsome personality, Sienna will be the perfect furry family member! 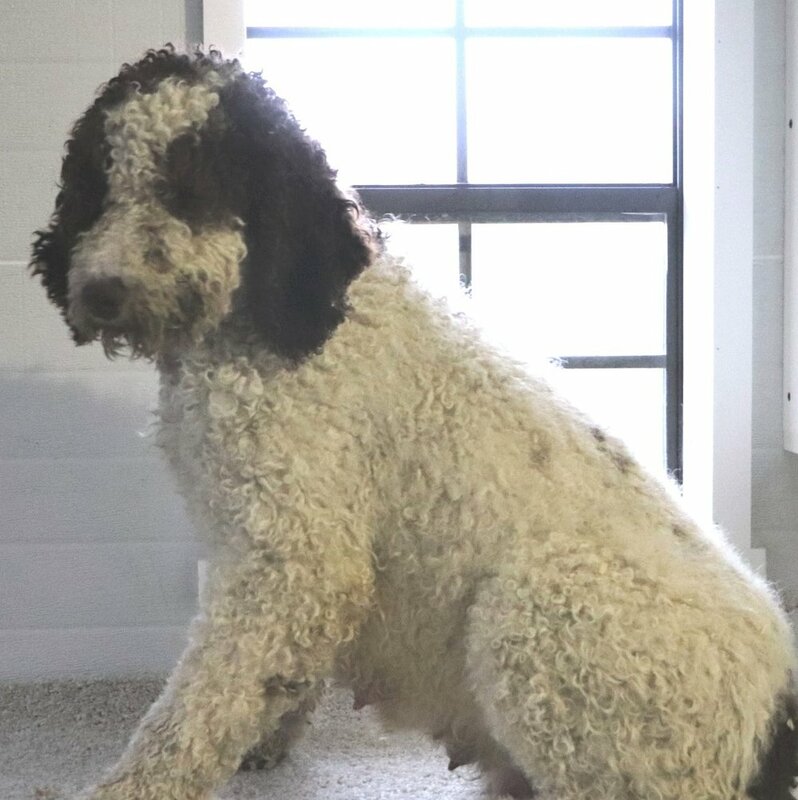 Samantha is a gorgeous apricot and white Sheepadoodle with a sweet personality. Nothing seems to faze this little girl, and she is cheerful and affectionate. We know that she will be a great companion for any family or individual! Sage is an adorable puppy with a love for life and people! She loves to hang out with us and especially loves playing with her siblings. Sage’s black and white coat really shows off her Sheepdog heritage and she will make a wonderful family member for years to come! Sahara is a fun, happy, sweet girl! She has a beautiful white coat with some apricot markings, and we think her coat will only grow thicker with age. She loves company and would do anything for play time or a belly rub! Skip is a fun-loving little guy with an extremely handsome black and white coat. Skip gets along great with children and will make a lucky person or family very happy! Simon is a loving little guy with a wonderful personality. He loves to be held and petted and is very good with kids. We know that he will be a wonderful companion and will get compliments wherever he goes! Santiago is so much fun to be around and is a very intelligent puppy. He is very smart but still has a huge heart! He has a gorgeous white coat that is super soft, and he loves to be petted. We can already tell that he is very loyal and should be easy to train! Seth is a handsome little boy that has a white coat with adorable black markings. He is a good playmate who loves to please us! Seth is very loyal and sweet, and we know that he will make a wonderful furry family member.